A comprehensive new report into the health needs of people residing in Northern Sydney has been released by the Northern Sydney PHN (operated by the Sydney North Health Network). The Needs Assessment presents a local population with the highest life expectancy and lowest premature mortality in Australia. However a changing, growing and ageing demographic highlights the at-risk groups, geographic hot spots and specific health challenges that need to be addressed in the Northern Sydney region. 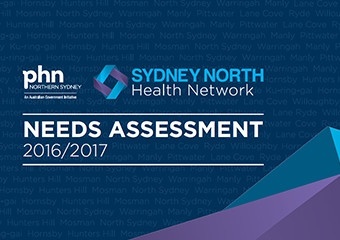 “The Needs Assessment is a vital piece of population health planning and service analysis that increases our understanding of the health needs of our community now and into the future,” said Sydney North Health Network (SNHN) CEO, Ms Lynelle Hales. Alcohol related hospitalisation – Alcohol contributing to hospitalisation is an emerging problem in some parts of the region with rates higher than the NSW average. In Mosman (54% higher than NSW), in Manly (53% higher than NSW), and in Lane Cove (45% higher). Female hospitalisations are increasing at a higher rate than males. Cancer – Over 5,000 people are expected to be diagnosed with cancer in 2016. However, with cancer screening and early detection available for some cancers types, it can be a preventable cause of morbidity and mortality in Australia. One year olds – 90.8% in Northern Sydney compared with 91.3% nationally. Two year olds – 87.6% in Northern Sydney compared with 89.2% nationally. Five year olds – 90.4% in Northern Sydney compared with 92.2% nationally. Chronic Conditions – An estimated 40.2% of the population has one or more chronic conditions compared with the 42.3% state average in NSW. Disability – More than 27,000 people in the Northern Sydney region have a profound or severe disability. Emergency Department Attendance – The 0 to 4 years and 80+ year’s age groups have the highest rates of emergency department attendance of all age groups in the Northern Sydney region between 2010 and 2014. Mental Health – 12% of people report having a long-term mental health condition. Mental Health – The mental health and wellbeing of young people in the region has been identified as an area of particular concern, with issues relating to bullying, self-harm, anxiety and depression. Population Growth – In the next 15 years, the population of people aged over 65 is projected to increase by 43.3%, fuelling demand for services that respond to the health and care needs of Northern Sydney’s ageing population. Premature Death – Almost 1 in 5 premature deaths are attributed to lung, colorectal or breast cancers in the region. Youth – There are approximately two separate presentations to an Emergency Department every day in the region for self-harm or suicidal thoughts or attempts in the 15 to 19 years age group. The Needs Assessment is presented by key health themes that have been identified as top areas of concern – Health of the Elderly, Mental Health, and Urgent Care. Issues relating to the impact of the social determinants of health and there outcomes, including access to primary care, stress and addiction were also explored. “The next step in our population health planning and response is to commission health services that will meet the identified needs of our priority and at risk community groups,” said Ms Hales. “We will collaborate with our health partners including the Northern Sydney Local Health District, general practice and allied health providers to build the workforce and maximise service usage so together we can achieve better health and better care for our community,” concluded Ms Hales. To view the full Needs Assessment, CLICK HERE. To view the Health Information & Fact Sheet, CLICK HERE.